All transactions are safe and secure with a reliable history in online purchasing behind each of our associates. 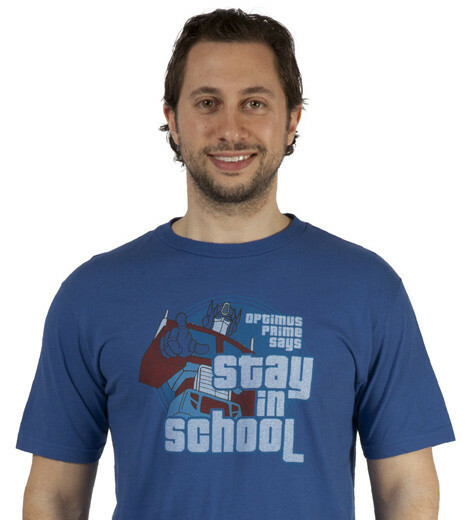 Buy the Optimus Prime Says Stay in School Transformers t-shirt to own Transformers clothing and merchandise. Autobots are the "good guys" in the Transformers cartoon. They are led by Optimus Prime, and they have come to Earth from the planet Cybertron to stop the Decepticons from destroying our planet for energy. They are also staunch advocates for education, especially Optimus Prime. This blue Optimus Prime Autobots t-shirt displays the leader of the Autobots next to his piece of advice, "Optimus Prime says stay in school." After all, who's going to fix the robots when they can't fix themselves. In addition to the Optimus Prime Says Stay in School Transformers tee above, browse the Transformers Clothing Gallery for more apparel like men's and women's clothes, kids shirts or hoodies.